Outstanding Arcanum MVCTC FFA members included Sidney McAllister, Ethan Garbig, Anna Loxley and Landon Haney. Arcanum MVCTC FFA Star members included Isaac Smith, Ellie Fout, Ryan Delk, Bella O’Daniel, Austin Stephens and Zach Smith. Honorary chapter degree recipients Janelle Brinksneader and Phil Garbig were presented their awards by Sidney McAllister and Zach Smith. 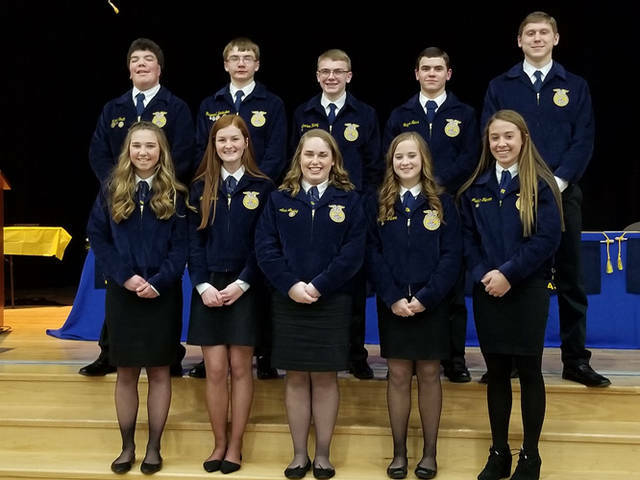 The 2019-20 Arcanum MVCTC FFA officer team includes (front row, l-r) Gracie Garno, Maggie Weiss, Anna Loxley, Alexis Wilcox, Madelyn Fearon, (back row, l-r) Isaac Smith, Raymond Denniston, Landon Haney, Blayne Hess and Cael Gostomsky. 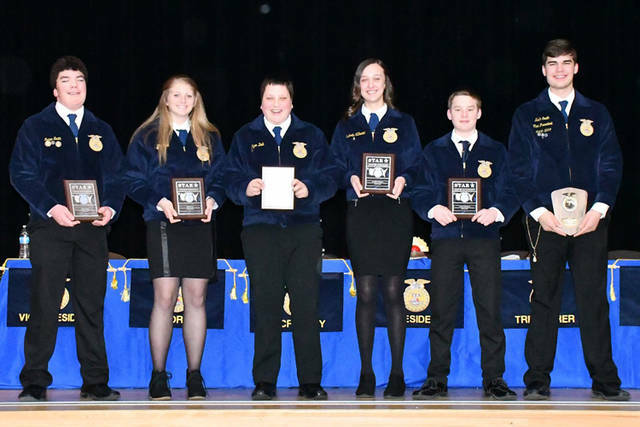 ARCANUM – The Arcanum MVCTC FFA held its annual banquet on March 24 that celebrated the accomplishments that the FFA members accumulated over the past year. To begin the ceremony, Sentinel Maggie Weiss introduced and thanked all of the guest of the Arcanum MVCTC FFA. Included in the list of guest were teachers, staff members, board members and administration from Arcanum and MVCTC. Members were recognized for their participation in various chapter activities and new levels of degree membership attained. The first sets of awards were given to members who participated in Career Development Events this past year. President Sidney McAllister and the rest of the officer team first recognized teams that competed last school year after the FFA Banquet. The First CDE recognized was the outdoor power team. The team place fifth in the district and included team members Ethan Garbig, Levi Walker and Clay Hoop. The ag tech and mechanical systems team consisted of Cael Gostomsky, Levi Walker, Ethan Garbig, Alex Weiss, Cole Beck, Jacob Osswald, Blayne Hess, Braden Garbig, Brody Williams, Isaac Smith, Austin Stephens, Laney Fourman, Zach Ullery and Raymond Denniston. The top four members completed the hands-on portion and placed first in the state. The ATMS team also placed second at the Eastern State Exposition and 16th in the nation. The final CDE of the 2017-18 school year was grain merchandising. Members of the team were Alex Weiss, Jacob Osswald, Kaylee Wilcox, Samantha McAllister, Cole Spitler, Zach Smith and Anna Loxley. The top four members competed in the state finals were they place fifth in the state. The grain merchandising CDE was sponsored by the Brinksneader family. The first CDE of the new school years was rural soil judging with the team consisting of Raymond Denniston, Zach Smith, Luke Brinksneader, Vance Wetzel, Jacob Warren, Austin Stephens, Laney Fourman, Landon Haney, Isaac Smith and Anna Loxley. The urban soils team consisted of Gracie Garno, Jake Goubeaux, Levi Walker, Cole Besecker, Ethan Garbig, Blayne Hess and Ryan Delk. The 2018-19 agricultural technology and mechanical systems team members were Ryan Delk, Blayne Hess, Cole Besecker, Isaac Smith, Austin Stephens, Brody Williams, Luke Brinksneader, Marcus Fourman, Raymond Denniston, Landon Haney, Ellie Fout and Jacob Warren. The top four members completed the hands-on portion and placed 10th in the state. The food science team members were Ryan Delk, Maggie Weiss, Eleanor Pease, Bella O’Daniel, Regan Weaver, Marcus Fourman, Ellie Fout and Alexis Wilcox. Delk, Weiss and O’Daniel completed in the hands-on portion at the district contest. The job interview contestants were Gracie Garno and Madelyn Fearon. Both members competed at the district contest where Fearon placed second in her division. The public speaker for Arcanum were Landon Haney and Bella O’Daniel in creed and Anna Loxley in extemporaneous speaking. O’Daniel moved on to the district contest. The job interview and public speaking CDEs were sponsored by Graves-Fearon Insurance Agency. The 2018-19 grain merchandising team members were Isaac Smith, Blayne Hess, Zach Smith, Luke Brinksneader, Landon Haney, Anna Loxley, Kaylee Wilcox and Austin Stephens. The team of Isaac Smith, Hess, Zach Smith and Brinksneader competed in the state finals and finished third in Ohio. The greenhand quiz team members were Ellie Fout, Ryan Delk, Cameron Daugherty, Bella O’Daniel, Alexis Wilcox and Jenson Whittaker. The final CDEs recognized were the spring judging teams. The general livestock judging team consisted of Sidney McAllister, Blayne Hess, Jake Goubeaux, Anna Loxley, Alexis Wilcox, Emily Wenning, Luke Brinksneader, Raymond Denniston, Vance Wetzel, Cael Gostomsky, Zach Smith, Laney Fourman, Austin Stephens and Eleanor Pease. The wildlife management team members were Cole Besecker, Preston Gibson, Regan Weaver, Maggie Weiss and Josh Wright. The diary judging team included Ellie Fout, Landon Haney, Anna Loxley, Sidney McAllister, Hailee Rehmert, Maggie Weiss and Brody Williams. The Arcanum MVCTC FFA recognized Superior Implement for sponsoring the banquet meal and Katrina Unger for helping to the coordinate the event. Special awards also were given to members that excelled throughout the past year. 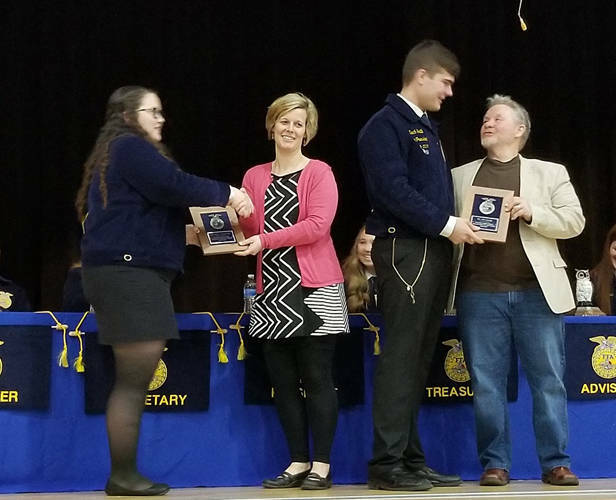 Top fruit sales persons award were presented to Vance Wetzel, third; Kaylee and Alexis Wilcox, first; and Raymond Denniston, first. Brian Pohlman then addressed the crowd and gave an appreciation to the Arcanum-Butler Local School and Miami Valley CTC administration and boards of education. The chapter adviser then presented the top awards for the evening. The first five members were recognized with the Leadership Award – Vance Wetzel, Luke Brinksneader, Blayne Hess Raymond Denniston and Gracie Garno. The Leadership Awards were sponsored by Craig and Katrina Unger and SRL-Troutwine Insurance Agency. The top members in each grade were presented with the Outstanding Member Awards. Pohlman talked about each member’s involvement and then presented him or her with a plaque commemorating his or her hard work. They were: freshman Landon Haney, sponsored by Jed and Penny Smith; sophomore Anna Loxley; sponsored by Jed and Penny Smith; junior Ethan Garbig, sponsored by the Pohlman family; and senior Sidney McAllister, sponsored by the Pohlman family. Star Award recognize members accomplishments. The Star Greenhand Awards were sponsored by Keir and Diane Smith, and this year’s winners were Ellie Fout, Bella O’Daniel and Ryan Delk. The Star Chapter Farmer Award, sponsored by Alpha Omega Genetics, is given to the member who has excelled in a SAE that is related directly to the farm. This year’s recipient was Isaac Smith. The Star Chapter Ag Placement Award, sponsored by Keir and Diane Smith, is given to the member who works in a placement ag area. This year’s recipient was Austin Stephens. The Star Chapter Ag Business Award, sponsored by Craig and Katrina Unger, is given to the member who works in an ag related business. This year’s winner was Levi Walker. The Ag Accomplishment Award is award to the member who has excelled in ag and FFA. This year’s Ag Accomplishment Award winner was Zach Smith. Senior chapter officers were recognized for their year of service. 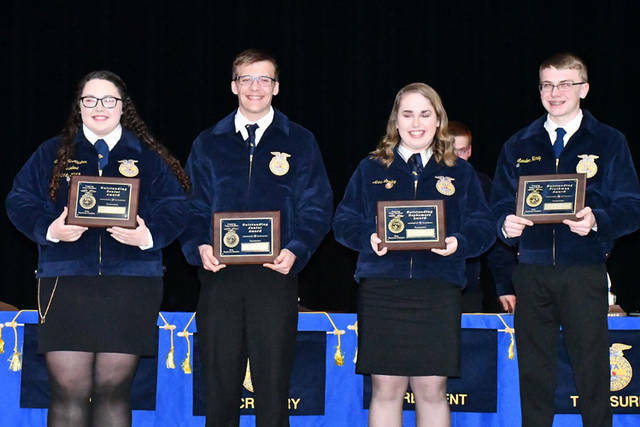 The officers were Secretary Kaylee Wilcox, plaque sponsored by John Landis Farms; Vice President Zach Smith, plaque sponsored by Craig and Katrina Unger; and President Sidney McAllister, plaque sponsored by the Brinksneader family. The final awards of the night was the Honorary Chapter Degrees. This honor is bestowed on members of the school or community for their contributions to the success of the chapter. This year’s Honorary Chapter Degrees were presented to Phil Garbig and Janelle Brinksneader. The ceremony was concluded with the inductions of the 2019-20 Arcanum MVCTC officer team – President Gracie Garno, Vice President Raymond Denniston, Secretary Landon Haney, Treasurer Madelyn Fearon, Reporter Maggie Weiss, Sentinel Cael Gostomsky, Student Adviser Blayne Hess, Parliamentarian Anna Loxley, Historian Alexis Wilcox and Chaplin Isaac Smith.